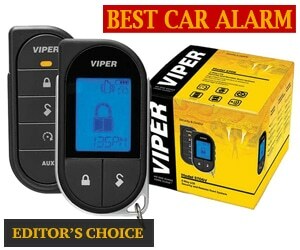 Viper has a well-earned reputation for being one of the best car alarm manufacturers around. Aside from the fact that this brand prides itself on providing a top of the line alarm system in general, Viper also goes the extra mile to make sure that it keeps up with all of the trends and new features being developed by rival manufacturers. 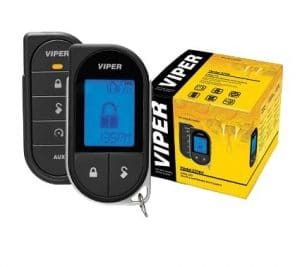 As such, the Viper is one of the most integrated car alarm systems with smartphones, offering a wealth of control features at the touch of a finger with their special app. Unlike some of the other car alarms which use a base app that is applicable with every car alarm system, the Viper app is a bit more refined and easy to navigate–you can even use it to track down your car in the event that it is stolen. Another advantage of the Viper is that it provides kill switches for both the engine and the door. Will the former is fairly expected for any decent car alarm, the latter is a bit more rare and highlights the Viper’s standard of excellence. This standard is only reinforced with the numerous sensors that Viper provides to protect your vehicle for various types of tampering. 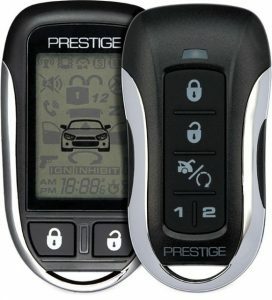 The Prestige car alarm is by no means the most impressive product on our list. However, as the budget option, it still manages to surprise by providing a number of features that you would not expect to find at this price. For instance, the Prestige provide a number of options when it comes to programming. In fact, this car alarm system has a few programming options that even the higher priced car alarms lack like the ability to set multiple timers at varying amounts simultaneously. Granted, some of the other products are able to have more than one timer, but the Prestige can run five separate timers simultaneously. Another unexpected quality of the Prestige is the series of convenience features that it comes with. Of course, it does not surpass the other car alarms on our list, but it still offers various controls with lighting, including headlights, dome light, and hazards as well as the ability to make it either an active or passive system depending on your preferences and needs. The Python car alarm is almost identical to the Viper in so many ways that one would be forgiven for confusing the two. Of course, this actually makes perfect sense since both the Python and the Viper are manufactured by the same parent company. In fact, the primary difference between the Python and the Viper are the demographics to which they are marketed. Specifically, the Viper offers a handful of features that the Python lacks and is a bit better in terms of overall performance. Still, for the difference in price, the Python may turn out to be the better value for you. One of the biggest issues with the Python is its range. The brand advertises a one mile radius, like a lot of the other car alarms on our list, but they make it a point to tell you that this range is tested under ideal conditions. Basically, the signal of the Python is not strong enough to travel through walls–something that can be a big problem if you live in a large city. However, the Python does provide the same wealth of alerts–both visual, auditory, and text-based–that the Viper offers. 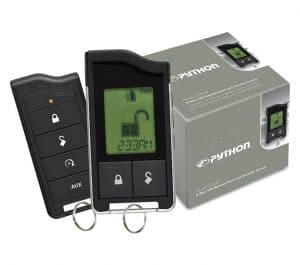 Moreover, the Python provides the same robust amount of sensors to alert you to different types of intrusions–just keep in mind the limited range applies to this function as well. 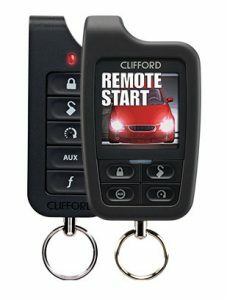 The Clifford car alarm is by far the most expensive product on our list. As if that were not enough, it is not even the most feature heavy product either. However, Clifford is one of the few models we reviewed that provides enough adaptable modules that you can make your car more protected than any other car alarm on our list. Moreover, in terms of the base alarm system, the Clifford is no slouch in this department either. For one, even the standard car alarm system uses the SuperCode encryption method. This encryption is exceedingly difficult to crack and will require extensive, and expensive tools to do so. Essentially, if you have a half a million dollar car that you need to protect, the Clifford is a good place to start. Of course, the premium quality for a premium product does not end there. 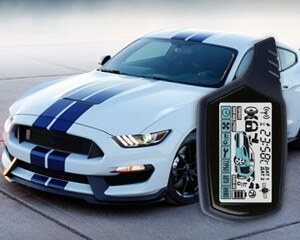 This car alarm is also the only model on our list to feature a full color OLED screen on its two way remote. This allows you to receive the normal swatch of updates you would expect, but the image is far more clear than with other car alarms and features more display options. Unfortunately, the Clifford is an exceedingly complex car alarm system and should only be installed by a professional dealer. Some car alarms can be wired at home with a multimeter and some circuitry knowhow, but the Clifford is more complex than that. Moreover, if your car already comes with an onboard killswitch, you will need to purchase the bypass module separately. The Code Alarm system is not the flashiest, nor does it come with every top of the line feature. However, it does offer a number of features that can make your life more convenient in general. Moreover, this is the only car alarm system on our list can actually be wired to two separate vehicles. This last bit is important because it is often much cheaper to simply purchase the requisite automotive components for a car alarm system than it is to outright buy a second system for another vehicle. In fact, the remote is generally the most expensive component of a car alarm. That is why the fact that the Code Alarm system can have to alarms run from a single set of remotes is so convenient. However, that is not the only area where this car alarm sets itself apart with convenience. 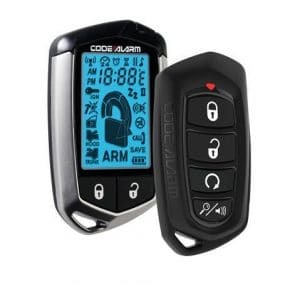 This car alarm provides the ability to remotely start your vehicle and even offers a timer system, so your vehicle will remotely start at the same time every day–whether or not you specifically use the remote to tell it to do so. It will also keep track of your parking meter times as well. Unfortunately, the sensors of this car alarm are somewhat limited to impact sensors, and they do not use encrypted pass codes. This means a well-equipped thief could conceivably get around the alarm. However, unless you have a six figure vehicle, no thief that well-prepared will be looking to boost a mid-range ride. When it comes to car alarm systems, there are generally two types: active and passive. Much like many of the different features of car alarms there is a clearly superior option, but it also comes with a cost–as will be the trend, this cost is quite literal as well. Active car alarm systems function in the way you see in television or cinema. The driver exits the vehicle and manually arms the alarm with the press of a button. Ultimately, there is no advantage to this type of system as it merely adds an extra step in the process that can be forgotten in the midst of a chaotic retreat. This is especially relevant if you are unloading your vehicle and have to contend with active children. The passive type of car alarm automatically arms itself the second you shut off the engine and lock the car doors. This is by far the more convenient option as it requires fewer steps, and you are far less likely to forget to lock the doors altogether. However, passive systems may trigger accidentally if you run out to the car to grab something real quick and forget to disarm them. 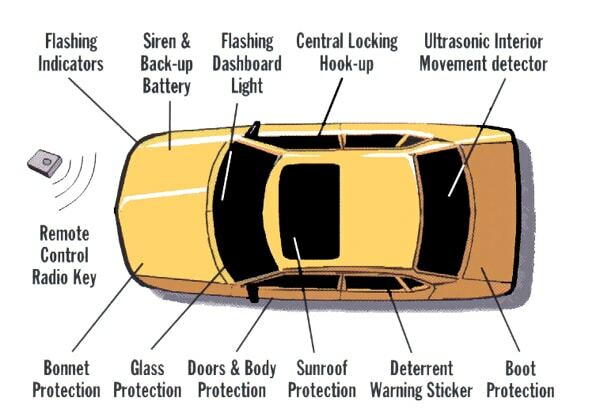 This is the most important feature of a car alarm as it ultimately determines what type of tampering the car is protected from. Keep in mind, it may be easy to consider that you want sensors on your door locks and windows, but there are a number of other sensors as well. The most common type of sensor is the impact sensor. This sensor essentially keeps track of when your lock is manually unlocked. If someone tries to unlock your car without the key or remote, this sensor is what alerts the alarm to sound off. The next most important, and common, type of sensor is the breakage sensor. This sensor essentially tells you if anyone has broken one of the windows to get into the vehicle. Considering that bypassing the lock requires a bit of knowledge and finesse, it is actually far more common a car thief will simply try to break a window instead. Motion sensors are far less common among less expensive car alarm systems but fairly common at the higher end. However, even high-end car alarms differ in the degree to which their motion sensors offer coverage.Most motion sensors will track movement in front of and behind the car. 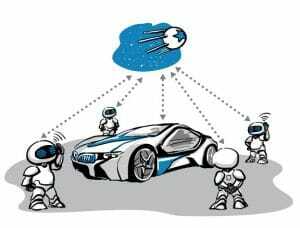 However, different car alarm systems may employ side and angled motion sensors. These sensors will provide far more coverage for your car, but they are also liable to generate far more false positives as well. Tilt sensors are the final and least common type of sensor. This sensor is ultimately designed to prevent your car from being towed away from its parking space or to prevent the hubcaps and tires from being removed. Depending on the make and model–and location–this may be a valuable feature to have. While pretty much every car alarm makes some type of noise when it is activated, some alarms offer a wider range of options that provide nuance to the type of alert that you receive. For instance, the number of different alarm sounds as well as their volume can differ drastically depending on the car alarm in question. Ultimately, if your car alarm only offers a single type of sound, then you do not know what type of issue to expect when you go and check on it. For instance, some of the higher end car alarms will have a sound that is designed to alert potential false positives, potentially saving you numerous trips to check on it in person. Moreover, the volume of the alarm can also provide nuanced information as to the type of threat the car may encounter. If the motion sensor is tripped, the volume is liable to be much lower and the alarm shorter in length to provide a warning and deterrent. However, if the tilt sensor is activated, the alarm will blare at full volume–often 120 dB. In the event that a burglar is able to bypass the alarm or simply ignores it and still steals your vehicle, it is always nice to have a backup plan. Thankfully, these days, some car alarm systems offer the option to track your vehicle. Essentially, these high-end car alarms function as a lojack as much of as a traditional alarm. Should the car be stolen, all you have to do is connect to the manufacturer’s website and, if the alarm is still functional, it will connect to the nearest cell tower and provide a triangulated position. Of course, this is only relevant if the car is brought to or left at a place where it can reach a cell tower with its, generally, one mile signal radius, but that happens to be the most common type of car theft in many places around the country. Moreover, if your car is taken to a chop shop, the alarm will be the first thing they remove. This, again, is another feature that has a clearly superior option. 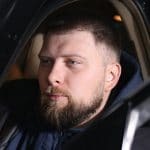 However, much like any other instance of similar comparison, the better option will also significantly increase the total cost of the car alarm such that it may be priced out of your range. 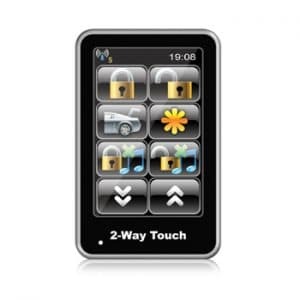 Still, if you want the best car alarm available, you will definitely want to invest the extra cash and make sure that your car alarm features two-way communication. Essentially, this means that whenever something happens to your vehicle, the car alarm will transmit the source of the alert to your handheld receiver. These receivers generally feature either OLED or LCD screens as well as a number of programmed words and icons to let you know what triggered the alarm. Some of the higher end car alarms will even display non-emergency information like the car’s internal temperature or its GPS position. Should the car alarm not deter potential burglars, your next best line of defense will be a kill switch. However, depending on the quality of your car alarm, your vehicle may be outfitted with one or more type of kill switch. The most common, and most effective, type of kill switch involves killing the engine should your car be broken into. This kind of kill switch will prevent the burglar from hot wiring your vehicle and will even keep the engine dead if the hub underneath your dash or steering wheel is removed. 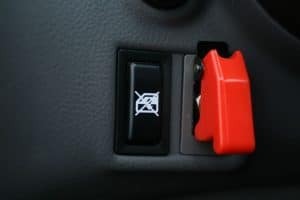 Ultimately, this kind of kill switch will require generally at least five to ten minutes to disable–and even then, it can only be disabled by an experienced and skilled car thief. The second type of kill switch is less common, but can make stealing your car just as difficult. Essentially, this kind of kill switch prevents your car from being unlocked once the alarm has been set off. The installation of this switch is more involved, but it prevents manual unlocks of any kind without first disabling the car alarm. Ideally, a car alarm system will come with everything you could imagine and then numerous features you would not even think of. Of course, there are those types of car alarms available, but they also cost a pretty penny. That is where modular car alarms come into play. Maybe you do not have the hundreds of dollars necessary for a top of the line car alarm system. No sweat, there are many high end car alarm brands that offer less expensive systems with fewer features that can be upgraded over time. Some of the best car alarm brands like Viper, Python, and Clifford offer discounted car alarms that allow you to expand their capabilities in the future with additional modules once you get the cash together. With so many people living in a digital space, it is only inevitable that more and more of our daily lives will come to revolve around those pocket-sized computers that never stray far from our fingertips. The car alarm market is no different in this respect. While not as ubiquitous as one might prefer, smartphone integration is becoming a far more common concept among car alarm features. Granted, smartphone integration is generally still reserved only for the higher end models of car alarm, but the options available are still often fairly impressive. Car alarms that track the vehicle if stolen will generally utilize your smartphone to tell you where the vehicle is. Moreover, if your car alarm offers a wealth of non-threat based information, like internal temperature, you are generally able to receive the information on your smartphone. And of course, any car alarm system with smartphone integration will allow you to run and even tweak the car alarm’s settings from the comfort of your phone–allowing you to remove one more item you otherwise would need when leaving the house. As we can see, the best car alarm is not a title that will fit every person equally. Depending on where you live and the type of car you drive, you can easily spend hundreds of dollars for an over the top car alarm that, while effective, is a bit overkill for your needs. If you are looking for an option that will deal with most threats, the Prestige or the Clifford Alarm should do nicely. Both of these car alarms are on the less expensive side and are ideal for owners of automobiles valued around $30,000 or less. Of course, if you own a luxury vehicle that may present a more enticing prize to would be thieves, both the Viper and the Clifford offer wonderful options. The Clifford is a bit steeper in cost but can be expanded well beyond the Viper’s capabilities. However, the Viper offers the easiest and most complete control with extensive smartphone integration. Do any car alarms on the market secure a vehicle against the rolljam device? I paid $850 for Python 7754p (alarm & installation) several years ago and its useless against this device! Well this article was useless and full of misinformation. Next you didn’t even reccomend 5 different systems, you only RECCOMENDED three because the DEI models you listed are ALL THE SAME. The Viper, python and Clifford have the exact same control module so their features are 100% the same. On top of that, the remotes in the Viper and the python are also 100% the same (one you remove the slightly different plastic shell from them) and the ONLY difference the Clifford has is that the remote has a color screen instead of black and white (but still uses the same code and freq so the range is identical) which is funny since only one of the three you listed to have “One of the worst ranges out of any car alarm on our list” when it’s range is identical to the other two DEI options. I also found it very misleading to list one of the cons for the Clifford as needing a bypass module (not a modulator…) which is standard with all of the systems on this list, not just that one. Also, you are just straight one incorrect about the Pythone not having smartphone integration… It does, it has the same data port and uses the same smart start module as both the Viper and the clifford does.